This is probably my last post based primarily on content from the very useful Skinboats of Greenland (Ships and Boats of the North) by H.C. Petersen. Along with describing a few more interesting aspects of the umiak's use, it's an excuse to show some more nice images. When rowers became weary or bored, they would sometimes enliven themselves with a "game" consisting of establishing and maintaining an unusual stroke pace: for example, five long strokes followed by two quick, short ones. At least this would focus the oarsmen's attention away from their weariness for a while. 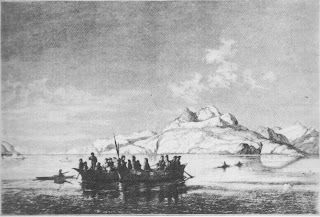 Another relief from rowing was to be had on some journeys, as when traveling to a seasonal camp to hunt seals or caribou. When families relocated on the mainland, it was common to hug the coast, and to allow the dogs to follow along the shore. Dogs learned the locations of seasonal homes and camps, and in many instances they would cut out across the land and arrive before the boats did. But sometimes, along stretches of straight and easy coast, the umiak would be tied to a harness of dogs, and the dogs would haul the boat for miles. Of course, care had to be taken to steer the boat to avoid it being pulled into shore by the dogs, and a sharp lookout kept for rocks near the surface. A Danish official on a voyage in an umiak owned by a European cleric, 1875. Photo by E. AE Lutzen. During the colonial period, Danish officials used umiaks with native rowers for voyages of inspection (again, with kayak escorts), and clerics used them to visit remote flocks. Several voyages of coastal exploration by Europeans were also conducted in umiaks, from the 17th to the 20th centuries. 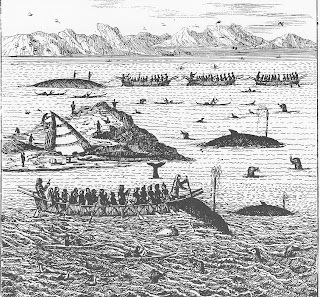 Whaling n Greenland, by Hans Egede, 1741. The triangular object at left center is a hunting-camp tent. And umiaks were used for whaling, both before and during the colonial period. 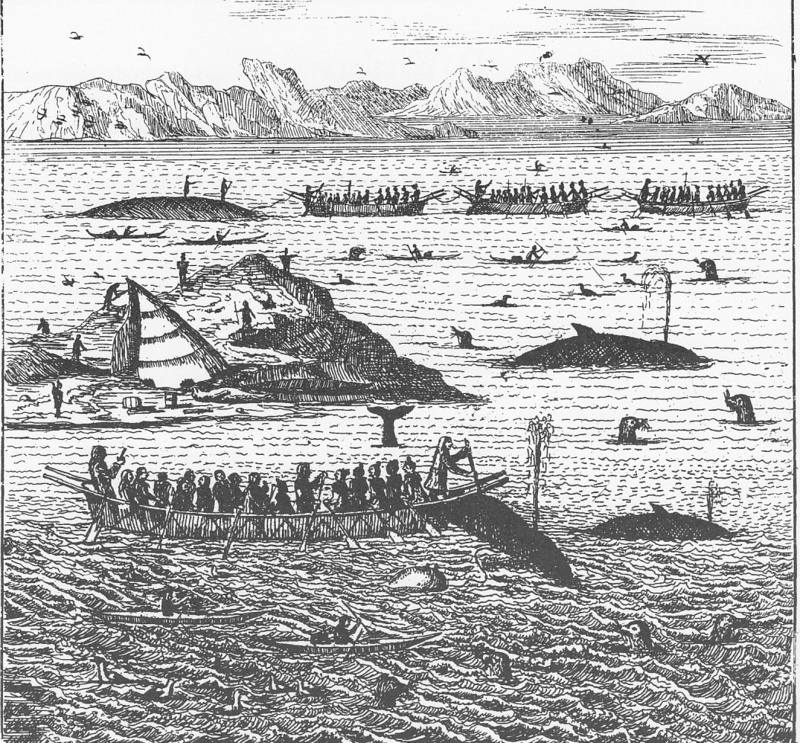 Several kinds of whales were hunted with hand-thrown harpoons. Whalers attached inflated sealskin floats to the ends of their harpoon lines and, after a successful strike, they would follow the floats, striking with additional harpoons as the opportunity arose. The floats prevented the whale from sounding deeply, slowed the whale down as it sought to flee, and enabled the rowers to keep track of the whale's position, allowing them to avoid taking a Nantucket sleighride in their fragile umiak. After the whale died, a man would enter the water to tie its mouth closed and to insert a wooden plug in its blowhole, to keep it from sinking. Several umiaks usually hunted together, because it takes a lot of oars to tow a large whale to shore. Men generally rowed the umiaks when hunting whales, but women would take an oar if a sufficient number of men could not be found to make up a crew. In the old engraving above, it appears that there could be stern-facing rowers and forward-facing paddlers in the same boat -- presumably the women "manning" the oars, and men handling the paddles. One or two men stood in the bow as harpooners, and the boat was steered by a male helmsman . Note the three umiaks in the background, towing a whale in "line ahead." In the early 20th century, toward the end of the umiak's period of practical use, men adopted the "female" or European practice of facing aft and rowing with an oar on the gunwale, as shown below. Aft-facing male oarsmen in Ilulissat harbor, 20th century (?). The coastal stretch from Kap Farvel to Melville Bay on the West Coast [of Greenland] covers about 2000 km, and the umiak has been the connecting link along this coast. During the summer the Greenlanders used to sail in many umiaks together in hunting expeditions of varying length, or to visit friends. There were large summer meetings like those in Taseralik at the mouth of Nassuttooq where umiaks from north and south gathered. Hunters met in the large fiords for reindeer hunts, some sailing up to 1000 km to reach these meeting places. Friends got together, trading was carried out and at the meeting places at the outer coast European whalers could be seen by the mid 17th century. Young people met, marriages were arranged, arguments were settled by singing contests, and there were sports. The umiak brought the Greenlanders together and made group activities possible. Getting back on topic: the Greenland umiak was rowed, not paddled. Some sources have said that rowers sat one to a thwart, as shown in the picture at top, but instances of two rowers per thwart are also known. Often, the rowers all sat toward the bow, leaving much of the aft section free for cargo or passengers, while the helmsman (or more often, woman) sat in the sternsheets, steering with a paddle. Sealskin strip used as a grommet to hold the oar. Oars were usually held on the gunwale with grommets made of strips of sealskin tied to a thwart or the inner stringer, although sometimes a fixed half-rowlock (thimble?) was used. Oars were two-piece, with blades attached to shafts, not carved from a single piece, and some of them featured a button that helped prevent the shaft from slipping through the grommet if the oar was released. Two-piece oar with safety button. Umiaks were also sailed. A short mast was set up right in the bows, passing through a hole in the headboard. Square sails, made of seal or reindeer skin or seal intestine, were lashed to a yard that was raised and lowered with a halyard that passed through a hole in the masthead. There were no stays or shrouds. Sheets led from the clews (lower corners) of the sail directly to the thwarts, where they could be tied off. The squaresail was used only for downwind sailing, and it is possible that the Inuit learned about it from the Vikings. Later contact with Europeans influenced them to adopt the spritsail, of which they used an essentially square, very low-aspect-ratio version. Greenland umiak under sail, 1767. 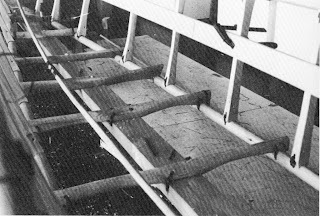 ﻿An important accessory of the umiak was a pair of short wooden logs, used primarily as rollers to move the boat into and out of the water while preventing abrasion to the skin. When it was necessary to travel in very rough conditions, sometimes these rollers would be lashed athwartships to the gunwales near the stern, each one extending outboard an arm's-length on either side. Then a pair of kayaks, their cockpits sealed with paddling jackets, would be lashed to the underside of these outrigger shafts, temporarily turning the umiak into a more stable trimaran. Continuing our earlier discussion of the Greeland umiak, the frame was built entirely of driftwood (until sawn lumber became available after European colonization), and mostly lashed together with strips of sealskin. As described by H.C. Petersen in Skinboats of Greenland (Ships and Boats of the North) , the bottom consisted of a keel and two chine stringers, connected by several floor timbers or "bottom ribs," The bottom ends of the side ribs did not match up with the floor timbers; rather, they were fastened to the chine stringers between the floors. In addition to the three bottom longitudinals there were three longitudinal members on each side. Working from the top down, these were: the sheer stringer or gunwale, the inner stringer, and the (outer) side stringer. The gunwale was round and let into semicircular notches at the top of the side ribs. The side stringers were sized and placed so as to force the skin away from the side ribs, so that it contacted the framework along the sides only along the gunwale, the side stringer, and the chine stringer. This accomplished two functions: it made for a smoother, quieter hull, without indentations in the cover between every rib; and it minimized the surface area of skin in contact with the framework. This latter was important to aid in drying the cover and thus preventing rot. The inner stringer supported the thwarts and provided a lashing point for the cover. The cover was stretched around the boat's bottom, around the chine stringers, and up over both gunwales. Holes were pierced in the edges of the skin, and continuous sealskin strips were led from the inner stringer, through a hole in the skins and back down to the stringer, over and over again, to stretch the skin tight. The gunwale was rounded to ease the stretching of the skin over and around the sheer. Atop the stem and sternpost was a headboard, a small, trapezoidal platform angled slightly down inboard to match the sheerline. The gunwale ends were lashed to the sides of the headboards. In some instances, the gunwales would extend past the headboards, forming "horns" that served as handles. On other umiaks, the gunwales ended on the headboards, and horns were lashed on separately. 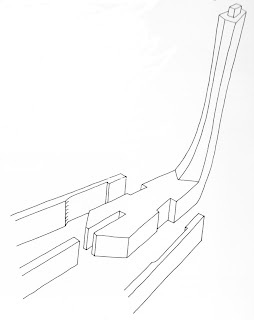 This was especially the case where the horns were to be bent in at the ends toward each other to form a closed loop, as shown at the bow (right) of the image at the top. The stems were tenoned into square mortises in the headboards. 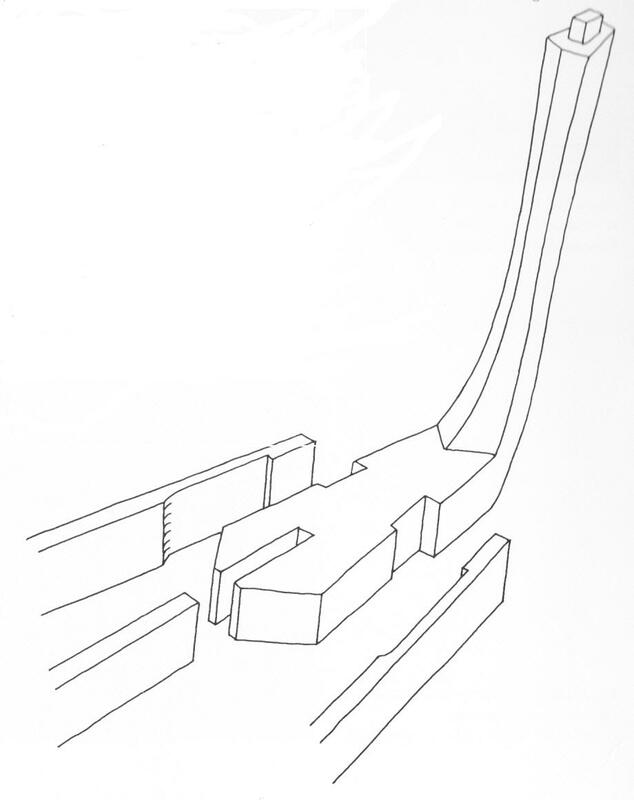 In east Greenland, the inner stringers were sometimes mortised partway into the side ribs, and occasionally the ribs were pierced entirely so that the inner stringers passed through rectangular holes in the side ribs. (This would have required considerably more labor but produced a much more rigid structure.) Neither of these practices were followed in west Greenland, where the inner stringers were always placed flat on the inboard surface of the side ribs. Another factor distinguishing west Greenland umiaks (above) from east Greenland umiaks (below) is flare, the western variety being considerably more straight-sided. Note also the conventional curved sheer of the western example, compared to the slight reverse curve of the eastern boat's sheerline. East Greenland umiak, by A. Saelen, from Petersen. Note the hooked scarf in the keel, the substantial flare amidships, and the reverse curve of the sheer. 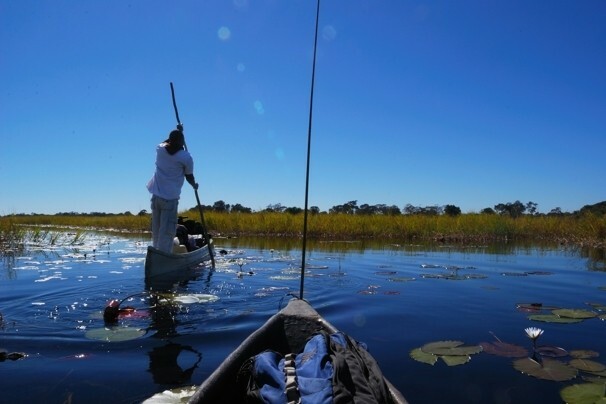 There's a travel article in today's Washington Post about a tour of Botswana's Okavango Delta in the local dugout canoes. Called a mokoro, the canoe is carved from the trunk of a sycamore fig. Propulsion appears to be mainly by poling. That's about the sum total of information about the boats themselves that you'll find in the article, but if you're looking for a holiday in an indigenous boat, this sounds like some fun. "In the Greenland legends the umiak appears almost as often as the kayak," writes H.C. Petersen, in Skinboats of Greenland. "It was part of the daily life." The umiak was used throughout and beyond the North American Arctic, from eastern Siberia and Alaska to Greenland. (I wrote about the angyapik, the umiak of St. Lawrence Island, in the Bering Strait, here.) It was the vehicle used by the Inuits to colonize the Thule region of northwestern Greenland (and from thence, the rest of the island), and there is good reason to believe that an early version was used by the island's first inhabitants, the Dorset culture. Petersen writes, "I enjoy following the trail of the Inuit ancestors along the long coast of Greenland, on the mainland as on the islands. It is just as difficult to manage without a sea-going vessel in Greenland today (i.e., 1986) as it was 4500 years ago. The land is scarred by deep fiords (sic) and off the mainland there are extensive archipelagos. To survive, a family vessel is needed, especially as the greatest part of one's subsistence must be taken from the sea." Often referred to as the "woman's boat" to distinguish it from kayaks, which were used exclusively by men, the umiak was really the Greenland family's boat, for its capacity (or "burthen" -- what a fine word!) was essential to the Inuits' nomadic lifestyle. True, when moving from place to place, the men might paddle their kayaks in convoy with the umiaks, as shown in the top illustration. But without the umiak, there would have been no transportation for the young, the aged, or cargo of any sort -- to say nothing of the women who rowed and steered them. And umiaks were used by men, for hunting whales. Greenland umiaks ranged from five meters to more than ten meters in length. Until the island was colonized by Europeans, who made sawn lumber available, the umiak frame was built entirely of driftwood, since no trees grew on the island. Working without metal tools or fasteners, the Inuit developed a strong, flexible, lightweight structure characterized by impressive woodworking and thoughtful design. The illustration below shows the complex joinery between the stem or sternpost and the keel and chine stringers. (Sophisticated hook scarfs were also common, and were often used instead of the mortise joint between the stem and keel as shown.) Fastening at the stem/sternpost was done with pegs of bone, tusk, or antler, and/or by lashing with strips of sealskin or baleen. 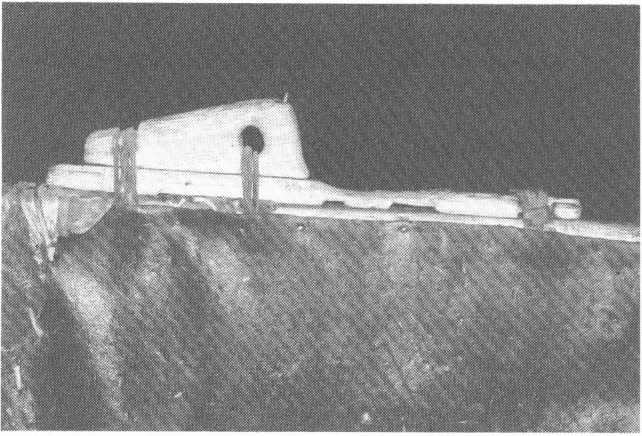 Complex joinery between stem (or sternpost), keel, and chine stringers. Almost all other joints were lashed with sealskin strips. As shown below, the lashings were fed through holes bored in the members, in order to prevent the lashings from creating bulges beneath the skin cover. Boring these dozens of holes, using only a bow drill with a bone point, required an immense expenditure of labor, and would only have been done for a compelling reason. While it would have made the boat quieter and marginally faster through the water, the main reason was to protect the skin from abrasion. Reconstruction of an old Greenland umiak. Note how the bottom ends of the side ribs are hollowed to fit around the chine stringer, and how all joint lashings pass through bored holes. The umiak's cover was made of sealskin -- anywhere from seven to more than 30 skins were required, depending upon the size and species of seal, and the length of the boat. The cover was quite fragile, especially when wet, and the boat had to be removed from the water every day to prevent the cover from becoming totally waterlogged and disintegrating. Although great care was taken to lift the boat and avoid dragging it, some abrasion was inevitable, so the elimination of "hard spots" in the skin was essential to preventing the premature formation of leaks. I'll continue this discussion of Greenland umiaks in the near future.